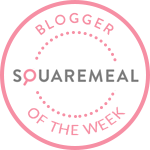 Emily's Recipes and Reviews | UK Food Blog | Leicestershire : a look at miller & carter in enderby + an instagram giveaway! a look at miller & carter in enderby + an instagram giveaway! The newest Miller & Carter to the Leicestershire suburbs, this well-known steakhouse has found itself in Enderby. Previously housing a Toby Carvery, the restaurant has been brilliantly refurbished and is now beyond recognisable as the same venue. A real turnaround, the quality of food included. With the classic Miller & Carter vibe of dark furniture, mellow lighting and quirky cow inspired prints, the restaurant has a sleek finish and a rather fancy menu to boot. The place is huge, but was soon filling up for a Tuesday night. Exposed brick, metallic fixtures and rich reds were found dotted amongst the modern interior. After a friendly and knowledgable welcome, we began with starters of Black Pearl Scallops (£8.75) and Pulled Brisket Croquettes (£6.75). The scallops, cooked in garlic butter, came with generous portion of pesto potatoes and crispy pancetta, lightened up by juicy tomatoes. The pesto was delicious and definitely something that worked really well with the perfectly cooked scallops. After a bit of an initial issue with the croquettes, the waiting staff apologised and offered us a couple of drinks on the house. It's worth mentioning they didn't know I was reviewing my experience, but couldn't apologise enough. The best customer service I've had in a long while. In comparison to the scallops, the croquettes were a bit of a disappointing portion. They were crispy and well flavoured, but there didn't seem to be much to the dish and we felt the salad lacked. The apology mocktails, or softails as they call them, were delicious. On the waitress's recommendation, we both opted for the Blackberry & Basil. Served over ice in a balloon glass, this had a base of sharp blackberry with fresh aromatic basil and a glug of lemonade. If you've been to a Miller & Carter before, you'll know about the wedge. The wedge is their signature move (except the awesome steaks of course) which means just before your steak is about to arrive, you'll be greeted with an ice cold lettuce wedge and dressing of your choice. They're pretty hard to eat, but a lot more refreshing that you'd expect. We went for the honey mustard bacon and garlic mayonnaise toppings - yum! The steaks themselves were the star of the show. Excellent quality, aged meat, with an extensive choice and helpful waiting staff. I went for the 100 oz Grain Fed Sirloin (£25.95), which is recommended as medium. A little bit more special than their classic sirloin, this premium cut is, as the name suggests, grain-fed and aged for 50 days for a deep and buttery flavour. This definitely shone through and felt like a real treat. The steak was well rested and just slightly pink, whilst still being tender to cut. My glass of red arrived right on cue; a glistening glass of Oyster Bay Merlot with a fruity but smooth flavour. My dining companion went for the 16 oz T-Bone, which is also £25.95. Recommended medium rare, the cut is made up of half fillet and half sirloin across the T-bone. With my friend preferring a pink finish to her steaks, she was still advised that medium rare would be okay. Actually though, it wasn't as pink as she'd like so perhaps rare would have been the best option here. The flavour and quality of the steak was delicious all the same. We went for the porcini mushroom and beef dripping sauces, which were great alternatives to your usual peppercorns and blue cheese. Alongside we enjoyed Lobster Mac 'n' Cheese (£4.95) and the Tomato, Mozzarella and Basil Salad (£3.50). The lobster macaroni cheese was invitingly creamy, which good chunks of tasty lobster. We thought there could have been more made of the salad, which torn mozzarella cheese and more basil. Not one to end on a negative, the rustic chips were incredible. Why all restaurants don't leave the skin on chips these days I'll never know. Fancy trying out your local Miller & Carter yourself? Now here's your chance to win a £50 gift card! To enter, simply head over to my Instagram (@emily_etc) and like my Miller & Carter photograph, as well as following myself and the Miller & Carter Instagram page. The giveaway closes on Friday 7th July 2017, where the winner will be selected at random. Find the full terms and conditions here. I was invited to Miller and Carter for purposes of review. The gift card prize has been provided for my readers.